Interview with Lauren Hollis, a teacher at Clay Academy in St. Louis, MO., about how she personally became involved in the school’s garden. 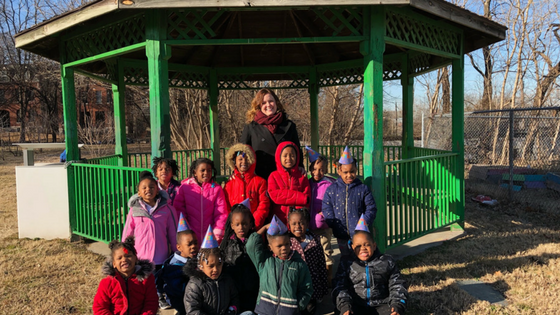 Educator Lauren Hollis standing with her class in front of Clay Academy’s gazebo in the school garden. How long have you been gardening personally? How long have you been gardening with students? Probably just 2 years. My parents have a pretty big garden. My mom just got started gardening but we’re both rookies. We Pinterest a lot of things. Were you hesitant to get outside at first? For sure. Taking the kids anywhere outside the classroom is a little bit nerve-racking. They have so much room to run and it makes me nervous. But the more you expose them to the outdoors, the more they listen and are familiar with it. I have learned a lot – I give my mom tips now, tried new foods like bok choy. What is your students’ favorite part of gardening? Exposing them to the outdoors. Getting them to try new foods, teaching them about their environment and what plants and animals need. What is your favorite thing to plant with your students? Tomatoes because they don’t really try tomatoes for lunch. They are not open to trying tomatoes, sauce, or in the salads at lunch. In the garden, they pick the tomatoes and they eat them just fine. Even if they don’t like them the first time, you let them try the tomatoes again. They still may not like them but they are willing to try them. Even the kale. They wouldn’t eat that normally but they will in the garden. Why do you believe school gardening is important? Gardens help the students learn more about their environment and learn where their food is from. Not all of their food comes from the grocery store or magically appears. Kids don’t get out very much or get to garden on their own. Gardens help them see a process – a plant growing or a pumpkin decomposing. What do you think teachers need the most in order to garden successfully? Confidence. In the beginning, I was so scared I was going to kill all the plants. Now I have experience and someone to answer questions. After going to the garden (for the past year) I would totally teach any lesson outside with confidence and not be worried. If I wouldn’t have gone to the garden every Wednesday, that never would have happened. I now can expose them to learning outdoors more. The Leaf Man. I love reading the story and letting them go find leaves. The things they turn the leaves into, even at this young of an age, is incredible. What are you excited to try this coming growing season? Plant things that I’ve never heard of or the kids have never heard of. Things that the kids are not exposed to. Next week we’re trying radishes. I am excited for them to try a radish. If they can eat Flaming Hot Cheetos, they can try a spicy radish. What is your advice for other school gardeners? Have confidence and just get out there. The more you are out there, the better your kids will acclimate to being outside. They need more exposure to the outdoors than the playground. Check out our In the School Garden Youtube playlist for short, actionable how-to videos that are seasonally relevant.